Our household didn’t always have a car. At one point we had a gold Singer estate, whose number plate I can still recite. (Never learn Russian…) At times, while my father was a scout leader, the minibus doubled up as a family car (no seatbelts, two benches, each made up of three planks of made wood and double doors that flew open when you turned corners). 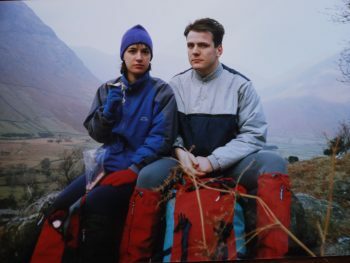 But my love of walking started in earnest in 1985 when my then boyfriend took me to climb Snowdon for the first time. My London-girl ground-level reaction was, ‘No way am I going up there!’ Two and a half hours’ of muscle burn later, I was standing on top of the world. Was my boyfriend pleased? No, he was not. He thought I hadn’t worked hard enough for it. Apparently you shouldn’t get to the top until your third attempt. You should be rained off, snowed off, blown off (I was once lifted off the pig track and thrown over the side of a ledge, but that was another occasion), otherwise you’ll never respect the mountain. But I was elated. What’s more, I was hooked. Today, as National Walking Month, draws to a close, I want to bring you more from other writers who walk. Those for whom writing is an essential part of the creative process; who literally walk their characters into being. A selfie from the late 80s in which neither of us looks particularly happy. Not the Snowdon boyfriend, but a different one. Also, this was not a good hat. 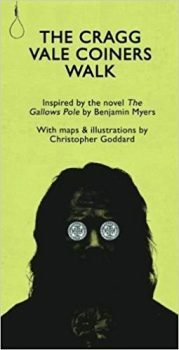 I want to start by mentioning Benjamin Myers’ The Gallows Pole, my favourite read of the year so far. It is a fictionalised account of the true story of David Hartley, the infamous Craig Vale coin clipper. (The edges of gold coins were clipped and counterfeit coins made from the clippings, which were put into circulation together with the clipped coins.) Ben is extraordinarily busy at the moment. Not only has The Gallows Pole been shortlisted for the Walter Scott Prize for Historical Fiction, but he has a new book out this week (Under The Rock). A novel hasn’t brought me so close to its setting since Sarah Hall’s Haweswater. It is populated by characters who are deeply rooted in the windswept landscape of valleys and moors, and who feel themselves not only far removed from London but abandoned by the monarchy. And so I was particularly delighted when I discovered that there is an illustrated map of the Cragg Vale Coiners’ Walk to accompany the novel. This is a collaboration between Ben and Christopher Goddard, and is interspersed with extracts from the book so that you can enjoy them on location. That’s my next walking trip sorted! Enjoying work in the location that inspired it is something poet Lucy Furlong knows all about. 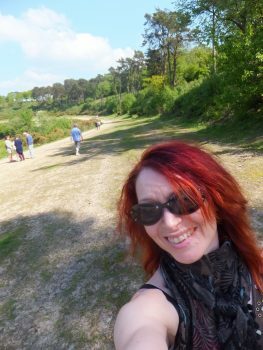 Lucy Furlong is a writer, poet and walking artist. She teaches and lives in Tolworth, and performs her work nationally. She has published two poetry maps, the first of which she called Amniotic City. By way of contrast, Over the Fields, is her love song to local strip of greenbelt, which sits on the borders of Surrey and Greater London, and is bisected by the River Hogsmill. Known by generations of the Furlong family, it was a recognisably rural reminder of Ireland for Lucy’s paternal grandparents, who arrived in Tolworth from their native Wexford, during the Second World War. For her dad, Nicholas, it was his and his siblings’ ‘second home’, a place for adventures and escapades, when they were growing up in the 1950s and 1960s; and where Lucy and her sister walked with Gran, and spent time with the rest of their family and friends. Lucy now explores the area with her son. I was lucky enough to be there for the launch walk. Lucy regularly organises walks. Read Lucy’s post about Walking in Richard Jefferies’ Footsteps. 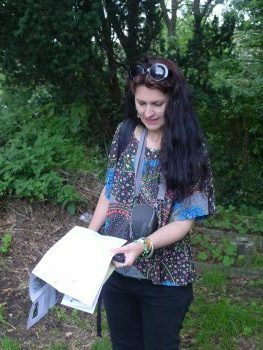 You can also learn more about Lucy’s walks on the Facebook page, Tolworth Treasure and the Hogsmill Hum. Lucy says, “Tolworth Treasure and the Hogsmill Hum is a series of walks and workshops that Alison Fure and I are leading this year. We both have a deep connection to the beautiful greenbelt land in and around Tolworth. We want people to come for a walk and see what a wonderful array of wildlife and history there is nearby. Walks are free of charge because we want everyone to have the opportunity to come and enjoy themselves and hopefully discover some ‘Tolworth Treasure’. 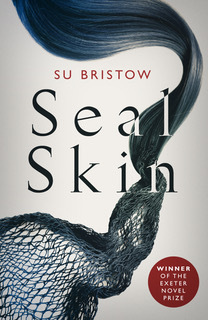 Su Bristow is a consultant medical herbalist by day. She’s the author of two books on herbal medicine: The Herbal Medicine Chest and The Herb Handbook; and two on relationship skills: The Courage to Love and Falling in Love, Staying in Love, co-written with psychotherapist, Malcolm Stern. 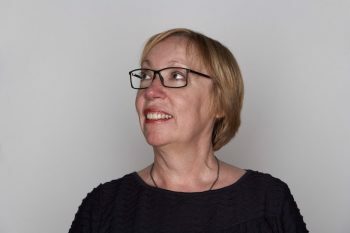 Her published fiction includes Troll Steps (in the anthology, Barcelona to Bihar), and Changes which came second in the 2010 CreativeWritingMatters flash fiction competition. Sealskin is set in the Hebrides, and it’s a reworking of the Scottish and Nordic legend of the selkies, or seals who can turn into people. It won the Exeter Novel Prize 2013. Her writing has been described as ‘magical realism; Angela Carter meets Eowyn Ivey’. But that’s the point. Walking and thinking go very well together, even if you are a Bear of Little Brain. There’s something about repetitive physical tasks that frees up creative thought; if you’re stuck, you need to move. Gardening does it for me, too, and even washing up by hand. But walking is the best thing. And if I’m developing a plot or thinking about a back-story, walking alone (or with someone who is happy not to talk) somehow creates the space for that sort of thought to flow. I think it’s something to do with passing through a landscape, feet on the ground and head in the clouds. We humans have been doing that, weaving stories as we go, probably since before we were fully human. It’s a well-trodden path, but there’s always something new to discover. Roz Morris writes fiction and essays about unconventional ways we can be haunted and how we seek people and places we belong with. Her work has been profiled by The Guardian, Literature Works, the Potomac Review, Rain Taxi and BBC Radio. She teaches creative writing masterclasses for The Guardian newspaper in London and is also the author of a series for writers – Nail Your Novel. Her most recent book is a collection of whimsical travel tales, Not Quite Lost. Who was it who described drawing as ‘taking a line for a walk’? I have a highly distractible brain, so if I want to concentrate, I go walking with an idea. The movement, the gradual change of the surroundings are just enough sensory noise to let an idea bed in and breathe. I live in London and couldn’t function without regular fixes of the Surrey countryside, so I’ll go off and get lost in a wood, or clamber a hill to perch on the edge of a view. 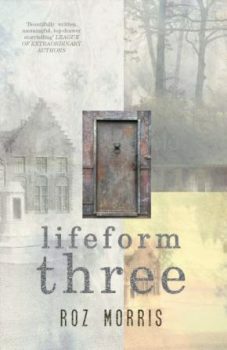 On one of my regular routes, I discovered a demolished country estate that became the setting for my novel Lifeform Three. I’ve always wondered about places that have come and gone. For years I kept a diary of them, which I released last year as a whimsical travel memoir, Not Quite Lost. Every road or path has older layers and rich stories, and we walk on them, touching the past through the soles of our feet. Clare Flynn is the author of seven historical novels. Her books deal with displacement – both physical and emotional and have a strong sense of time and place. They draw on her extensive travels and experience living in many different places. The Gamekeeper’s Wife was published in April 2018. I find there are two ways walking helps my writing. First of all it helps loosen the creative juices – fresh air and physical movement are essential to fuelling the brain. I’m always more ready to write when I have had a good walk. Last week, I wrote 2500 words of my current work in progress, The Frozen River, directly as a result of a couple of walks along a canal towpath – they did the trick of unfreezing my writing when I’d believed myself to be stuck. Secondly it can actually provide stimulus and raw material for a book or a specific scene. 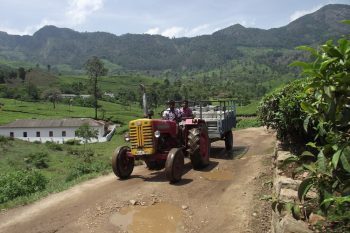 When I was finishing off my second novel, Kurinji Flowers, set in colonial India in the 30s and 40s, I was able to go to India for a couple of weeks to stay in a bungalow on a tea plantation. I was the only guest. In between writing I lived as my character did – painting (surrounded by gorgeous scenery this was no punishment!) and walking. I took a notebook/sketchpad and my camera and captured everything my character, Ginny, would have seen – plants, insects, birds. I sketched and snapped flowers, I wrote descriptions of the birdsongs and I photographed elephant footprints and droppings! Not everything made it into the book but a lot did. As I walked I became Ginny – imagining her feelings about something that happened, working out what she might do next. My latest book, The Gamekeeper’s Wife is set post World War 1 on a country estate. This arose directly from a short break in a former gamekeeper’s cottage. While there, walking through the woods, the core idea for the book came to me. I didn’t work out all the details at the time but crucially the two main characters arose from those walks: Christopher (Kit) Shipley, reluctant heir to the estate, damaged and minus one leg as a result of the war, and Martha Walters, the widow of the former gamekeeper who had been killed on the Front. Later as I was writing the book, those walks returned to me, creating pictures in my head, enabling me to visualise the view from the woods towards the huge pile where Kit lived. My walk around the ornamental Victorian ‘Swiss’ gardens near there became the basis for Kit’s sunken garden – the restoration of which becomes his passion. 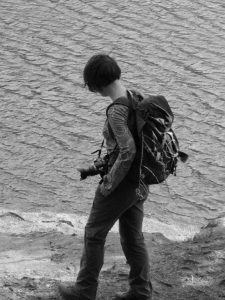 Again, a camera and a notebook aided my memory – but somehow when you have walked a place it stays more firmly rooted in your mind. Jane was born in Guernsey but grew up in Bournemouth. 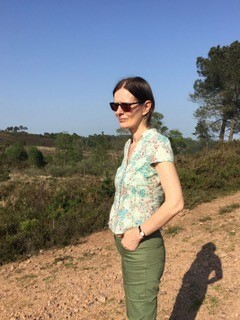 After a career in finance and latterly at Bournemouth University, she retired in 2007 and now spends several months a year exploring France and Italy. I’ve been to Provence many times and it’s the inspiration for my novels, Thirty-five Minutes from St Tropez, and its sequel, Stolen Summer. 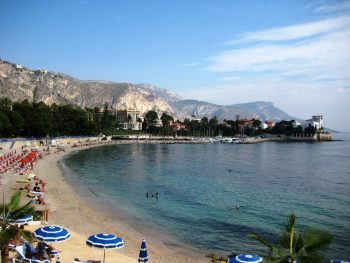 I’ve stayed in both Beaulieu-sur-Mer and Villefranche-sur-Mer, one on either side of Cap Ferrat, a few miles from Nice. A wonderful walk from either, further from Villefranche-sur-Mer, but delightful in the main, as it’s along by the beach, is to start at the Hôtel La Reserve de Beaulieu and stroll along Promenade Maurice Rouvier, the sparkling Mediterranean lapping at the rocks a few feet below. After passing actor David Niven’s former villa on the sea, La Fleur du Cap, and strolling through the tiny square named after him, Place David Niven, the views are fabulous as one looks over the beach towards the tiny picturesque port of Saint-Jean-Cap-Ferrat. Perhaps stop for coffee or lunch and then head on round Pointe de Saint-Hospice before retracing your steps. There are side trips to tiny coves or head up to the pink and white Villa Ephrussi de Rothschild which has panoramic views over the sea and coastline towards Beaulieu-sur-Mer and Monaco one way and Villefranche-sur-Mer the other. A glorious way to spend a day in the sunshine. Over to you. Are you a walker? Or have you been inspired to add walking to your daily routine? I used to detest walking. I couldn’t see the point of it. Why not run; you get wherever you’re going faster? Walking for walking’s sake just seemed stupid to me. Of course, growing up in Finland, walking in the woods was a national past-time, but usually you walked with a purpose: for berry or mushroom picking or to get to a lake for a swim. It wasn’t until we had a dog that I understood the calming effect of walking. The twice daily walks with Jerry provided me with uninterrupted thinking time. Being in the woods with him gave my brain its much needed rest, and this inactivity often gave birth to new plot twists or insights into my characters. Walking without ou beloved Jerry just isn’t quite the same. 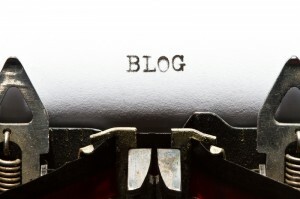 Great post, I must get back to my daily walking routine! I walk every day with my dog. Even f. Didn’t have a dog, I’d still walk. If I didn’t, I’d go stir-crazy very no ideas for my stories. If I get stuck with one of them, on go the walking boots.